With the number of fabric manufacturers increasing, customers can also nowadays choose from different fabric varieties. You just need to understand your requirement first as each of them fulfil certain purposes. For example, if you are from the industrial sector, you need something which is tough, strong and grease resistant. Apparel fabric, on the other hand, is much durable and comfortable. If you are planning to use the fabric to construct some outdoor product, choose something with colour retain qualities. The utility of the drapery or curtain fabric is entirely different from the one used to make a mattress or blanket. Though the renowned fabric manufactures can help you choose the ideal product, enhancing your knowledge about the common types of fabrics available is advisable if you want to make a wise investment. If your company is engaged in manufacturing standard swimwear, you need a fabric which is not only comfortable but also renders a dignified look. Nylon Lycra is gradually gaining popularity as a beachwear fabric as they can easily retain their shape and support inspite of being stretchy. Another fabric variety used as beach wear is velvet. The fabric used by filter bag manufacturers in India is quite environment-friendly. High-quality woven fabrics are sewed in such a way so that they meet the dimensional standards of the industry and the specific requirements of their clients. Technical drawings and models are used which makes it easier for them to manufacture sophisticated products. Wool is one of the loosely woven fabrics generally used to make blankets and bed clothing. They are quite heavy and so they can last for years even with a minimal maintenance. A majority of the blanket fabrics available in the market are quite warm and soft to touch. Approach any experienced curtain manufacturer in India and you will be surprised to see the wide variety of products they have to offer. There are numerous curtain fabrics these manufacturers can choose from and each of them has a very lightweight. The fabric is loosely woven which let you control the amount of light which can pass through it. 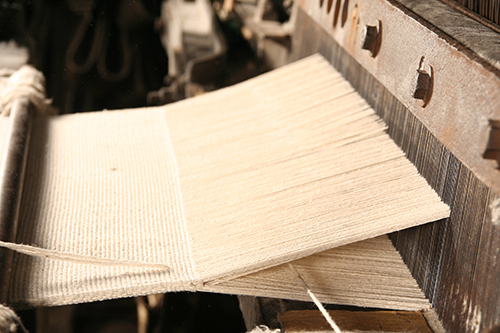 It is basically a woven fabric used to manufacture clothes or garments. They can be either used as covering purposes or for decoration. During the 16th century, cotton, wool and silk were all used as apparel fabric to make garments. Nowadays, fabric manufacturer in India let their customers choose from a wide variety of apparel fabrics with a unique visual appeal. Since a good night sleep is a priority for all, the fabric used to make the mattress should be comfortable. Manufacturers try to use high-quality polypropylene fabric to make the mattress protectors as they have a very soft and luxurious texture. Since you are now aware of the common fabric varieties, it’s time you approach a renowned manufacturer in India and choose one according to your requirement. How To Choose A High-Quality Filter Cloth For A Cleaner Equipment?